1) According to Reader's Digest, The Exorcist is the scariest movie of all time. Have you seen it, and if so, did it scare you? 2) The Exorcist has been made into a TV series on Fox, premiering last month. Have you become a fan of any of the season's new shows? 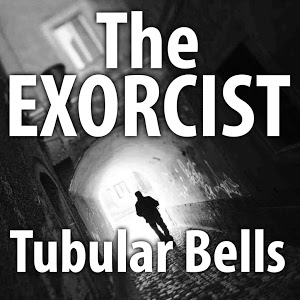 3) "Tubular Bells" is a popular ringtone for both Android and iPhone. What's your ringtone? 4) As Halloween approaches, do you watch more scary shows and movies? 5) Do you have any recurring nightmares? 6) Have you carved a jack o' lantern this year? 7) Do you like the taste of pumpkin seeds? 8) What will the trick or treaters who knock on your door get? 9) A Halloween "let's pretend:" Back in the 1950s, a home in your neighborhood was the site of a gruesome murder/suicide. Relatives retained ownership of the house but declined to live there. During the ensuing decades, a legend grew: The tragic couple haunts the halls. Generations of schoolchildren insist they heard strange sounds and saw curtains often move mysteriously. Now the house is about to be demolished. A local charity is raising money by sponsoring a Halloween sleepover. Would you be willing to stay in this haunted house over night? 1) This is an upbeat, positive song. Are you feeling upbeat and positive right now? 2) Justin Timberlake is a good dancer. And why not? In this song, he sings he has "good soul in my feet." Consider your own dancing talent and compose your own lyric: I have ___________ in my feet. 3) In the video, there's dancing in the laundromat. Do you have dirty clothes in the hamper, or are you all caught up with your laundry? 4) There's also dancing in the supermarket. What do you need to pick up at the store? 5) This song will appear in the upcoming Dreamworks Trolls movie. Some people believe Troll dolls are good luck. Do you have a good luck charm? 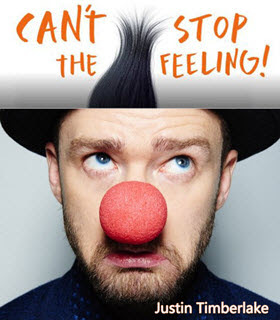 6) Justin Timberlake loves to dunk Oreos in milk. Crazy Sam thinks this is all wrong -- the way to eat an Oreo is to twist the two halves apart and lick the cream first. Which method do you prefer, Justin's or Sam's? 7) Justin admits to some fashion fails. He and Britney Spears wore matching denim outfits that he regrets, and he's sorry he ever tried cornrows. What about you? Can you think of a look you thought was cool at the time, but now it makes you shudder? 8) He is a very good golfer. When were you last on the golf course? 9) Random question: Think about your romantic involvements. Were you in love with one of them, some of them, or all of them? To add your link, and to see who else has played, click on the icon below. 1) This song is performed by a woman who is positively tickled to have unexpected company. How do you feel when people drop by unannounced? 2) She is clearly proud of her skills in the kitchen. Do you enjoy baking? Cooking? 3) Reference is made to hiring a band. Tell us the last time you were at an event with live music. 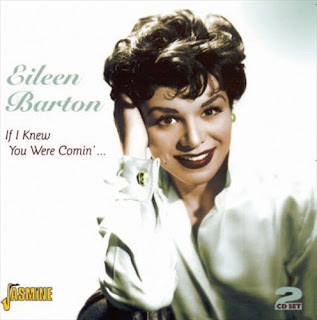 4) After making recordings in the early 1950s, Eileen Barton appeared on daytime TV in the early 1960s -- including a game show called Video Village. Let's say we're all headed to a TV game show taping this morning. Would you volunteer to appear as a contestant? Or would you rather just stay in the audience? 5) In 1961, Ms. Barton got married in Juarez, Mexico. What's the longest distance you've ever traveled to attend a wedding? 6) In 1950, when this song was popular, the Detroit Red Wings won the Stanley Cup. Are you looking forward to the upcoming NHL season? 7) 1950 also marks the first time anyone in the United States paid by credit card. Do you pay with a credit card to get rewards? If yes, what rewards are you accumulating (points, cash back, airline miles)? 8) In 1950, an athlete named Florence Chadwick swam the English Channel. Are you a good swimmer? 9) Random question: Think about the last "white lie" you told. Was it to spare someone's feelings, or to make your day go more smoothly? 1) This video begins with Ms. Clarkson on a swing. When you were young, did you prefer the swings or the slide? 2) The first words are, "Guess this means you're sorry." Who is the last person to apologize to you? 3) One of Kelly's earliest show business jobs was as an extra on Sabrina, The Teenage Witch. Do you believe in witches and warlocks? 4) Mentioning witches and seeing Kelly with a lollipop reminds Sam ... She needs to pick up a 1 lb. bag of Dum Dums for Trick or Treaters. Have you done anything in preparation for Halloween? 5) Ms. Clarkson's advice to aspiring young singers is not to listen to advice. "Everyone gives you their 2¢ worth, but you have to follow your gut." Are you good at soliciting and following advice? Or do you tend to follow your gut? 6) The year this song was popular, 2009, saw two major newspapers go out of business. Both the Seattle Post Intelligencer and Rocky Mountain News published their last editions. Do you still read a paper copy of your local newspaper? 7) In 2009, Mark Zuckerberg confirmed that Facebook tried to buy Twitter, but was rebuffed. Which social media site do you spend the most time on? 8) In 2009, the Balmain Collection included a pair of jeans that retailed for $2,165. What's the most you would pay for denim pants? 9) Random question: You buy a charity raffle ticket and tuck it into a friend's birthday card. Before you can give the card to her, the numbers are drawn and you realize the ticket is worth $500. Do you keep the ticket or give it to your friend, as planned?